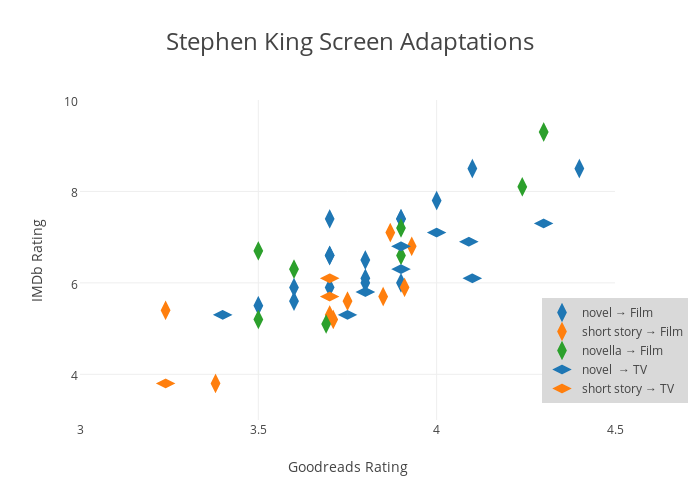 Chrispudney's interactive graph and data of "Stephen King Screen Adaptations" is a scatter chart, showing novel → Film , short story → Film, novella → Film, novel → TV, short story → TV; with Goodreads Rating in the x-axis and IMDb Rating in the y-axis.. The x-axis shows values from 3 to 4.5. The y-axis shows values from 3 to 10.